I recently sat inside our family’s RV on a Sunday afternoon, watching the lightening, listening to the thunder, and seeing the raindrops of the most recent storm blowing through our camp. 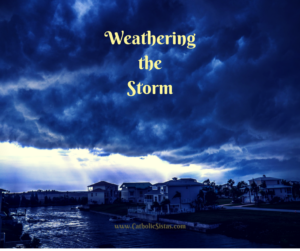 The rhythmic sound of the wind and rain lulled me to sleep, and when I awoke, I began to think of the metaphor between the storm I was experiencing in life and the storm which has surrounded the Catholic faithful. I have always heard reference to a storm being on the horizon, with the faithful being tested through it: “Not only that, but we even boast of our afflictions, knowing that affliction produces endurance, and endurance, proven character, and proven character, hope” (Romans 5:3-4). 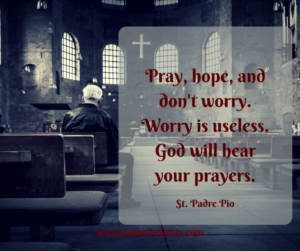 As faithful Catholics, we ought to prepared for storms. As we analyze the components of a storm, we see the divine power within. Much like the verse from Isaiah 35:4, thunder is the voice which reminds us, “He will come with vengeance, with terrible recompense, He will come and save you.” It wakens sleeping children, it rattles animals and humans alike, and it casts a pall of fear over those who sit directly under the boom. Clouds roll in to darken the earth during a massive storm. Thunder breaks the silence. And yet, in a good storm, lightening illuminates the darkness. Satan loves darkness. He loves secrecy and living in the shadows. Yet lightening brightens the sky, even if only for a flash. Lightening forces the demons to scurry. It brightens the path, showing the way to sanctuary. With all good storms, there is wind, too. The wind can cause chaos and confusion. It can blind even the best of seers, all-too-often forcing even the strongest among us to bend with the breeze and seek shelter from the wind. But the wind is also a force of change, as we are reminded in Acts 2:2: “And suddenly there came from the sky a noise like a strong driving wind, and it filled the entire house in which they were.” The wind gives strength to grit through the storm. Finally, with the storm comes the deluge of rain. Big, fat, drenching raindrops falling from the heavens and meeting the earth. Rain washes the dirt and grime from everything in its path. The rain cleanses. It purifies. My friends, we are in the midst of a storm unlike we have ever experienced as faithful Catholics. The storm is no longer on the horizon; rather, we are in the thick of it. The Church is being tested in a manner we have not seen before. This past month has been difficult for the Catholic Church. The devil is among us, looking to cause division, suspicion, anxiety, and suffering. And, he is hell-bent on destroying the foundation of the Rock of Peter. Literally. Too many priests, as fallible men, have fallen into the temptations of the devil. The sins of the cover-up, even more than the abuse itself, have played directly into the devil’s hands. Most priests are good, holy men, whose chosen vocation has been thrust into a terrible spotlight. They now are battling to endure and survive this storm. They are scrambling to safeguard their sheep who are experiencing doubt, fear, anger, grief, and betrayal. This past spring, a chaplain said during his homily, “When there is unity, it is a sign that the Holy Spirit is working. When there is division, it is a sign that the devil is at work.” The devil works tirelessly, with one aim in mind: to take souls for himself. Yet the sun comes out after the storm. The damage and debris from the storm won’t disappear overnight. It will take hard, dedicated, tireless work. It will require us to listen to the instructions in Ephesians 6:11: “Put on the armor of God so that you may be able to stand firm against the tactics of the devil.” We already believe the gates of hell shall not prevail against the Church, but the cleanup will take time, effort, and energy. At the end of the storm, the sun is on the horizon. It shines brightly, beckoning all to bask in its warmth, dryness, and glory. 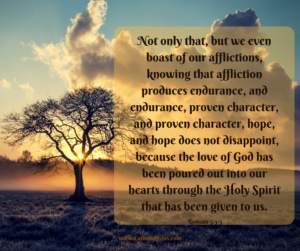 We are reminded that “hope does not disappoint, because the love of God has been poured out into our hearts through the Holy Spirit that has been given to us” (Romans 5:5). So suit up, my faithful Catholic friends. Join me for the turbulence of this storm. Let us weather it together, each playing our part to ensure the gates of hell do not prevail. We will stand together, facing toward the Son. Because He alone will be left standing, helping us out of the raging waters, drying us with His radiance.